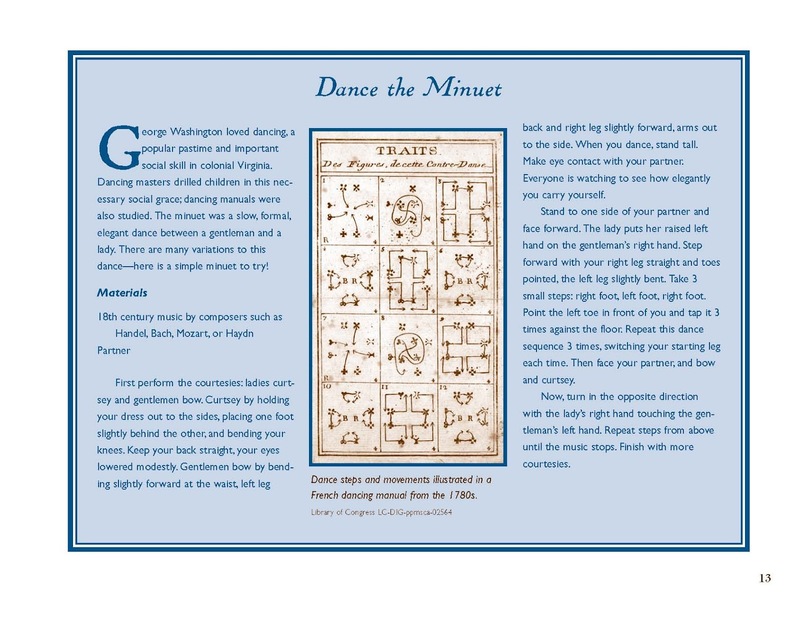 In George Washington’s day attending a dance was not for the faint of heart, but Washington and his fellow Virginians gladly rose to the task. Almost everyone knew how to dance. This social grace provided entertainment, exercise, the opportunity to flirt and a showcase for showing off. People traveled miles to attend glittering balls or more informal gatherings, dancing, eating, drinking and generally making merry. 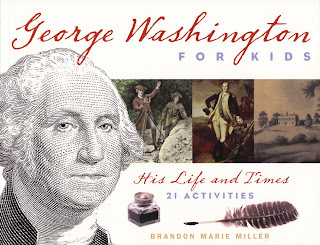 Washington loved to dance and favored lively country dances like reels. But to really make a mark in society, a person had to master a French minuet. Minuet dancing was serious business. Children learned their “courtesies” at a young age. This gesture of respect, a curtsy for girls and a bow for boys, was used on many occasions, but certainly on the dance floor. By age ten both boys and girls received dancing instruction through lessons or studying dance manuals. Country dances proved easiest to learn. The minuet, however, might take years to perfect. A teenager attending a ball could ruin their social chances with a clumsy, ill-timed step. There were many forms of a minuet. A formal dance with many fine steps, the minuet required absolute grace, perfect posture, and elegance. While a country dance allowed many couples to join in, a minuet was a performance danced by only one or two couples at a time. Everyone else ringed the dance floor, critiquing your performance—it makes one sweat just to think about it! Couples danced according to their rank of importance in society, so if the governor and his lady attended, they would dance first. If you were one of the last couples to dance, well...sorry for you. So in honor of George Washington, take a spin on the colonial dance floor. Wigs, stays (corsets) and buckled shoes are optional. You girls rock! And roll! Great blog! Glad I don't have to dance in front of everyone, but sure would have liked to watch George do it! Very interesting! Why don't they do the minuet on Dancing with the Stars? Brandon, I'm so happy you brought your site to my attention! As a Virginian (though I live in SoCal now), I love this post and all things colonial. I'm following you now via Wordpress.